See our Etsy shop for all of our latest designs and finished jewelry. We also take custom orders! 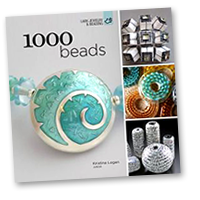 You can see Shannon’s “My Pretty Pods” beads in the book 1000 Beads by Kristina Logan. This gorgeous volume can be purchased here. Check out our updated schedules of classes and shows! To stay informed of our next classes, shows and the latest news from Sunroom Studios make sure you sign up for our newsletter (you'll find the form right below here, on the left!). Welcome to the website for Sunroom Studios. Please sign up for our newsletter and check back for new features, including more online shopping and tutorials! Sign up on our mailing list to keep up to date with our classes and events. © 2019 Sunroom Studios. All Rights Reserved.